You can find some directory or compressed archive file (the right option must be selected by switching the radio buttons). 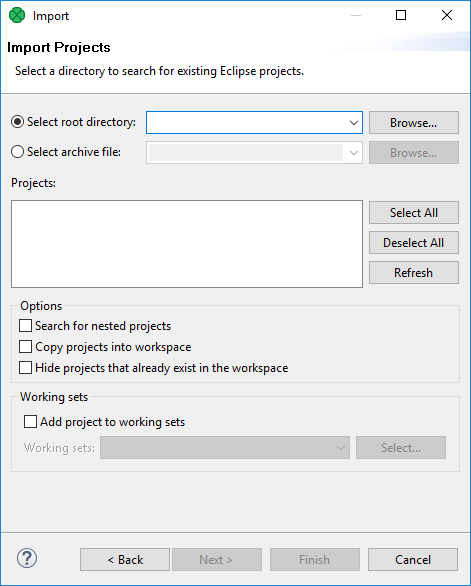 If you locate the directory, you can also decide whether you want to copy or link the project to your workspace. If you want the project be linked only, you can leave the Copy projects into workspace checkbox unchecked. Otherwise, it will be copied. Linked projects are contained in more workspaces. If you select some archive file, the list of projects contained in the archive will appear in the Projects area. You can select some or all of them by checking the checkboxes that appear along with them.